We have listed a deal on an used 34' Regal boat for sale in Florida! 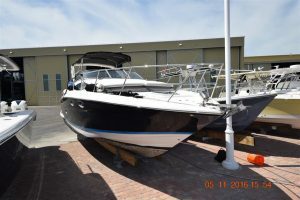 : Atlantic Yacht & Ship, Inc.
We have listed a beautiful used 34′ Regal boat for sale in Florida! Bill Leonard brings word from our Key West office that he has listed an used 34′ Regal boat for sale. In the first place, this used 34′ Regal was launched in 2007 and named “Worthless Crew”. In a word this is known as a Regal 3360 Window Express Cruiser. You will love her twin Mercruiser 350 Mag MPI gasoline engines. They allow her to cruise at speeds in the mid-twenty knot range. Together with her Kohler generator she is fully equipped with all the right options. Furthermore, being in great condition, she is ready for cruising with the family! As can be seen, this used 34′ Regal is a high-class stern-drive express crusader with beautiful lines. She gets high marks for total comfort, quality, and performance. The main cabin is well-appointed with teak and holly sole. As well as a convertible couch / dinette and a queen berth forward. Additionally she has a large midships berth. The unique forward windows provide plenty of natural light. In fact, this makes for the feeling of a much larger cabin space. Altogether, the galley has a 2 burner stove, microwave, refrigerator/freezer, and stainless steel sink. She is fully loaded with electronics and ready-to-go! For more information on this beautiful used 34′ Regal contact Bill Leonard today!